Welcome to the new Biopharmconsortium Blog! Haberman Associates’ Biopharmconsortium Blog, formerly at http://biopharmconsortium.blogspot.com, has moved to our own site. You can now find it at https://biopharmconsortium.com/blog/blog. If you’re here, you have obviously found the new site. Welcome! Our new site is now also powered by WordPress. We hope that you like the new format, and the WordPress features. We are new to WordPress, so will be making further improvements as we learn more about the system. As you may have noticed, many blogs that start out as Blogspot blogs (hosted by Google’s Blogger) eventually change to WordPress, and migrate to the blogger’s own site. Now our blog has migrated as well. Now that you are on our site, https://biopharmconsortium.com, we invite you to explore our site beyond this blog. You may look at the rest of our site to learn about our consulting services for life science companies. We also have PDFs of several of our published articles linked to our home page which you can view for free, with no registration required. And we have a list of our recent major publications on our publications page, with links to publisher sites where you may order them. We hope that you will continue to visit the Biopharmconsortium Blog, and to subscribe to our posts if you wish. We also welcome your constructive comments as always. 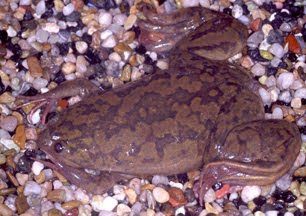 The cover of the 30 April 2010 issue of Science bears a photo of a tadpole of the western clawed frog Xenopus tropicalis. In that issue is a report on the draft sequence of the genome of this organism, and a short companion news feature. The report on the genome emphasizes X. tropicalis’ role as an emerging animal model in developmental and evolutionary biology and in comparative genomics. X. tropicalis is also an emerging animal model in biomedical research, potentially including development of disease models for drug discovery. We emphasize that potential role in Chapter 5 (“Xenopus tropicalis: an emerging model system”) of our book-length report, Animal Models for Therapeutic Strategies, published by Cambridge Healthtech Institute in March 2010. The Nature news feature, authored by Elizabeth Pennisi, also cites the potential role of this frog in biomedical research. X. tropicalis has about 1700 genes that are related to human genes that have been linked to disease. Some of these diseases are type 2 diabetes, acute myeloid leukemia, congenital muscular dystrophy, alcoholism, and sudden infant death syndrome. In our book chapter, we discuss efforts to develop an X. tropicalis model of congenital spinal muscular atrophy (SMA). We also discuss studies aimed at using the frog as an animal model of human congenital heart disease, and for developing novel therapies for these conditions. The related frog Xenopus laevis (known as the African clawed frog) is an old animal model that has long been used in developmental and cell biology research. However, X. laevis (pictured above) is genetically intractable, since its genome is allotetraploid, having been formed by fusion of diploid genomes from two different species. This makes genetic and genomic studies with this frog difficult. In contrast, X. tropicalis is diploid. X tropicalis also has a much shorter generation time than X. laevis, and is much smaller, thus requiring less space and making breeding and experimentation much more feasible than with X. laevis. Some of the same researchers that have been participating in the X. tropicalis genome sequencing project have been developing genetic tools such as transgenics, genetic screening, and gene knockdown using antisense morpholinos. With the determination of the genome sequence, X. tropicalis may join the zebrafish as a lower vertebrate animal model in developing novel therapeutic strategies for human diseases. Elsewhere on the animal model genome front, researchers recently published a draft sequence of the genome of Hydra magnipapillata. 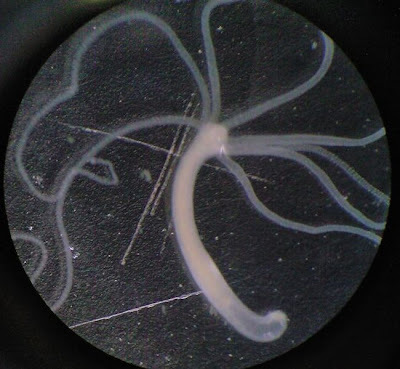 Hydra, a freshwater cnidarian or polyp, has long been a staple of high school and university biology lab courses, so is a favorite of many biologists. The University of California at Irvine, whose researchers participated in the Hydra genome project along with many others (e.g., leading genomics researcher J. Craig Venter), has long been a center of Hydra research, beginning in the late 1960s. Hydra is used as an animal model in the study of regeneration, body patterning, and stem cell biology. The determination of the genome sequence of Hydra will facilitate these studies, as well as studies of comparative genomics and evolutionary biology. Hydra may also be of interest for biomedical research. As discussed in the genome report, Hydra possesses four homologues of the Myc oncogene, which is involved in human cancers and also regulates pluripotency and self-renewal of mammalian stem cells. Myc is also central to the pluripotentency of Hydra stem cells. The researchers also found genes in the Hydra genome that are linked with Huntington’s disease and with the beta-amyloid pathway of Alzheimer’s disease. In our blog post on 10 February 2010, we discussed the controversy over Sirtris/GlaxoSmithKline’s reseveratrol formulation, and its second-generation sirtuin-1 (SIRT1) activators. Researchers at Amgen and Pfizer found that the apparent in vitro activation of SIRT1 by these compounds was an artifact of the experimental method used by Sirtris researchers. The Amgen group found that the fluorescent SIRT1 peptide substrate used in the Sirtris assay is a substrate for SIRT1, but in the absence of the covalently linked fluorophore, the peptide is not a SIRT1 substrate. Although resveratrol appears to be an activator of SIRT1 if the artificial fluorophore-conjugated substrate is used, resveratrol does not activate SIRT1 in vitro as determined by assays using two other non-fluorescently-labeled substrates. Last month, I attended two meetings at which this controversy was discussed. One was the Bio-IT World Conference & Expo in Boston. At that conference, Christoph Westphal (then CEO of Sirtris) gave a keynote address. In that presentation, Mr. Wesphal stuck with the story that Sirtis’ compounds and its assays are valid. The day after his presentation, Mr. Westphal resigned as Sirtris’ CEO, and now is the head of GSK’s SR One venture fund. He and other Sirtris and Vertex founders also started the Longwood Founders Fund in February of this year. At the other meeting (which was Harvard-related), one of the most respected leaders of the longevity-related pathway field (whose name I am withholding) stated that the whole resveratrol/sirtuin-activator story is nonsense. He did, however, concur with our views on anti-aging pathways as expressed in our November 8, 2009 article on this blog. We do not go as far as calling the resveratrol story nonsense, but remain unconvinced of the mechanistic basis for resveratrol action pending further evidence. Meanwhile, Derek Lowe’s “In the Pipeline” blog has a discussion of Mr. Wesphal’s talk at the Bio-IT conference. In its 25 March 2010 issue, Nature also has a News Feature centered upon the controversy. This article (written by Cambridge MA-based Nature reporter Heidi Ledford) basically says that the controversy remains unsettled, but that several laboratories are working to resolve the assay issue. These include corporate researchers at Sirtris, Leonard Guarente of MIT (another leader in the longevity-related pathway field, who is co-chair of Sirtris’ scientific advisory board), and Anthony Sauve of Weill Cornell Medical School (also a member of Sirtris’ scientific advisory board). There was a review of longevity-related pathways in the 16 April 2010 issue of Science. It covers all the bases of anti-aging research in yeast, worms, flies, and mammals, with an emphasis on the TOR and insulin-like growth factor-1 (IGF-1) pathways. Sirtuins and resveratrol rate a minimal mention in the review. Cynthia Kenyon, another leader in the longevity pathway field, published a review on the genetics of aging in a special Nature Insight section on aging in the 25 March 2010 issue. In this review, Dr. Kenyon discussed the panoply of aging-related pathways in worms, flies, and mice, especially the insulin/IGF-1 and TOR pathways, as well as several other biomolecules and biological processes. Dr. Kenyon discusses sirtuins, but notes the unknowns in aging-related mechanisms involving sirtuins, especially in mammals. She also notes the difficulties in interpreting results with resveratrol. In addition to the issue with the assays involving the fluorescent substrate, she notes that although (in studies conducted by Sirtris researchers and their academic colleagues) resveratrol has been found to extend the lifespan of mice fed a high-fat diet, it did not extend the lifespan of mice fed a normal diet. Dr. Kenyon also cited the results of studies with resveratrol in yeast, worms, and flies that are not consistent with the hypothesis that resveratrol extends lifespan by acting as a sirtuin activator. The bottom line of the discussion in the two reviews in Science and Nature is that lifespan is controlled by sets of complex, interacting pathways. Sirtuins represent only one control point in these pathways, which might not be the most important one. Thus no one company “owns” the anti-aging field in terms of drug discovery and development, and there is a lot of opportunity out there. Even Mr. Westphal stated as much in his Bio-IT World presentation. Interestingly, Dr Kenyon notes that different closely related animals can have large differences in lifespan. For example, rats live for three years, but squirrels for 25. She speculates that differences in longevity might be easily evolvable, and mechanisms by which lifespan changes during evolution (perhaps involving mutations in regulatory genes or that affect rates of respiration) might constitute novel intervention points. Now for some good news about aging. In an article in the 25 March 2010 Nature Insight section by James W Vaupel (Max Planck Institute for Demographic Research, Rostock, Germany, University of Southern Denmark, Odense, and Duke University), the author presents evidence that human senescence (i.e., deterioration with age)—at least in advanced countries—has been postponed by a decade. This process, first noted in 1994, is continuing. The factors that are making this possible are prosperity (which promotes good health) and medicine (including medical and surgical interventions to prevent or treat disability, and public health efforts). These two factors enable people to reach old age in better health, as well as promoting better health in older people. This ongoing postponement of senescence and mortality provides a foundation for ongoing anti-aging research and eventual treatments based on that research. (One must remember, however, that regulatory agencies as well as the practical considerations of drug development will not permit researchers and companies to utilize mortality as an endpoint in clinical trials. Companies must therefore develop putative “anti-aging drugs” for specific diseases associated with aging, such as diabetes, cancer, various cardiovascular indications, and dementia.) The postponement of senescence also has profound implications for how one lives one’s life, as well as for social policy and the practice of medicine.